Michael is the most famous baseball player in Alexandra. Ask any player in the club who their favorite baseball player of all time is, and they will answer Michael Lebepe. Aside from the one child who said Derek Cheetah, which of course means Derek Jeter, everyone else agrees that Michael is the one. Tucked between the sprawling city of Johannesburg and the glitzy corporate offices of Sandton, one of South Africa’s richest suburbs, lies Alexandra. If you have even a passing interest in South African history, you will have heard of Soweto on the other side of town, the much larger township known for the Soweto Uprising in 1976 and as the home of not one but two Nobel Peace Prize winners – Nelson Mandela and Desmond Tutu. Alexandra is less well-known than Soweto, even though in a way it has more history. It was the place where Mandela first settled when he arrived in Joburg in the 1940s. And it is also the place where Trevor Noah scraped by selling counterfeit CDs before he improbably ascended to the lofty perch as host of the Daily Show. The words you’ll hear most often in a conversation about Alexandra are notorious and crime-ridden. Street scene in Alexandra, 2011. Note the kids playing catch on the street. Michael’s life is not much different from any other child growing up in the township of Alexandra. He lives with his Mom, who works long hours to care for her extended family. At night, he shares his bed with a nephew who Michael says moves around a lot and keeps him up. He eats one meal a day of spinach and Pap ( a South African dish similar to grits) each night. He speaks four languages: English, Sepedi, Zulu and Xhosa. What makes Michael stand out from other children in Alexandra is his passion for baseball. He started playing when he was 11 years old, and he quickly became an all around player. He was fast. If he was on base, he would steal. If he was in the outfield, he could track down a ball. And, he was a left handed pitcher. Michael Lebepe in his Alexandra Badgers uniform running the bases during a Gauteng Baseball match. In 2013, Michael was selected as a South African National Player. 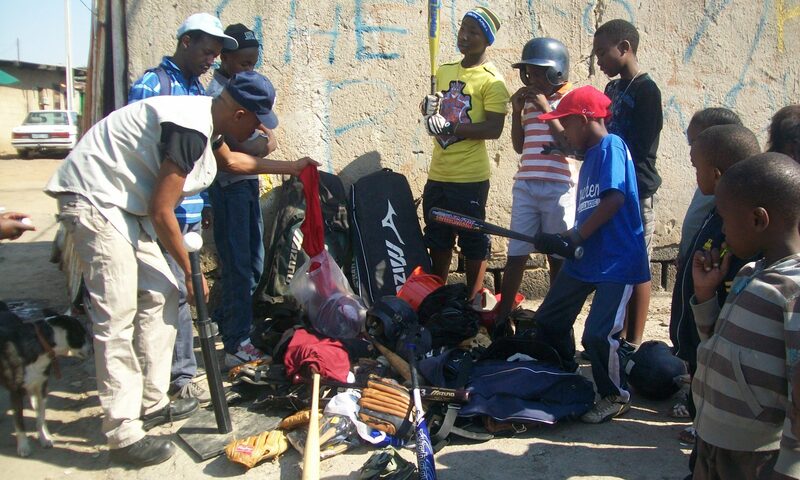 It was the very first time this honor went to a player from the Alexandra Baseball Club – a club that like many residents of the township itself wages a daily struggle for its survival due to the lack of funds. Neither the club nor Michael’s family could finance his participation on the South African National Team as it competed in the World Championships. Unfortunately for Michael, there would be no overseas travel to showcase his talent. But even so, Alexandra was proud of its baseball superstar, who ket accumulating one baseball award after another: Best Batter, Most Stolen Bases, Player of the Year. You Graduate High School. What Comes Next in a Township? But real life was less kind. When Michael matriculated from high school, he learned what so many other Alexandra residents come to know when their schooling ends: It is extremely difficult to find a job when you have nothing. No money, no work clothes, no food. Even when you have people helping you to take you to interviews or help print a CV, the repeated rejection is discouraging. It is easy to give up, to become depressed, to believe that you have no future. Michael struggled to find a footing and his friends and family were worried. One of my favorite pictures of Michael where he asked my son Ben for an autograph in 2013. It is Michael who should have given autographs as a South African National Team player that year. That’s how humble and kind he is. Not surprisingly, it was baseball that in some way saved him. This is, and always has been, the goal of the Alexandra Baseball organization: To give underprivileged kids in an impoverished township a home away from home, a place where there is friendship and learning and team spirit, a place where they can find hope for the future. Michael is still struggling, but he has come back to his baseball family. We all wish him the best as he once again is trying everything he can to secure a paying job. It is because of people like Michael that Africa On Deck was started. We need a bigger family to help all of the Michael’s coming up in Alexandra Baseball. It’s not, and has never been, only about baseball. Africa On Deck, Inc. is a 501(c)(3) organization formed in the United States to support Alexandra Baseball and other clubs in Johannesburg, South Africa. It was founded by a group of American expats who fell in love with a baseball team in an African township. Our current fundraiser will help us support Alexandra Baseball for the upcoming season, mainly by financing league fees, transport, and food. Please visit our Donation Page for more information.